Same day delivery is available for most gifts when ordered before the cutoff time. 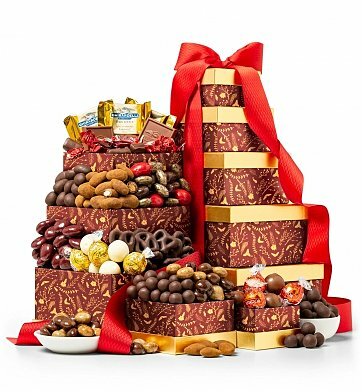 The cutoff time for The Golden Quintet Chocolate Tower is in the recipient's time zone. Luxury chocolates and truffles from Lindt, Ghirardelli and more. Five exclusively designed gift boxes stacked in a tower with ribbon. The gift was much better than the run-of-the-mill flowers and was greatly appreciated. They can't stop talking about it! The presentation was spectacular. The boxes are beautiful and well made each containing deliciously decadent chocolates. Anyone would appreciate this tower stack, held together with lovely ribbon,a thoughtful gift tag and a pair of scissors to for easy access. Happy holidays for the recipient.